For the past twelve years, I have avoided posting on any of my own papers, but I will stoop to some shameless promotion to mention my latest paper,1 since it touches on some themes I have discussed in the past. Back in 2011, Iwamoto, et al. 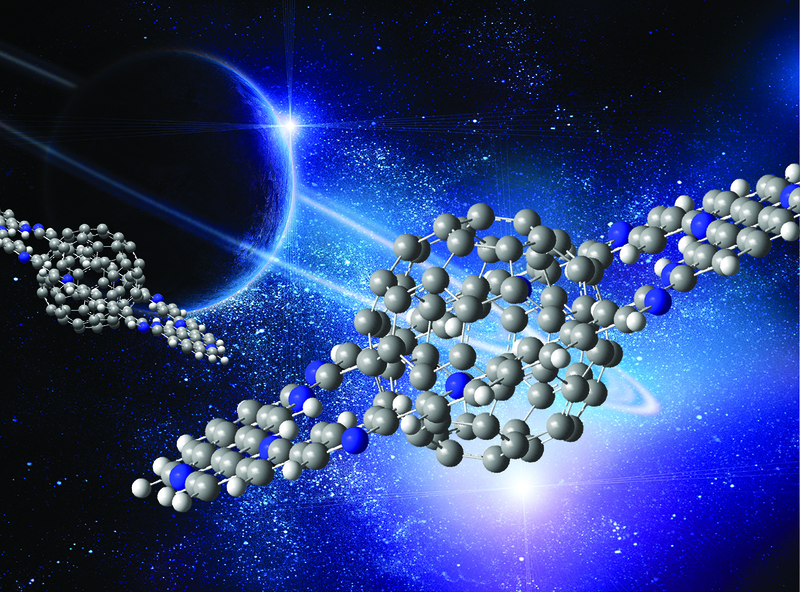 prepared the complex of C60 1 surrounded by cycloparaphenylene 2 to make the Saturn-like system 3.2 Just last year, Yamamoto, et al prepared the Nano-Saturn 5a as the complex of 1 with the macrocycle 4a.3 The principle idea driving their synthesis was to utilize a ring that is flatter than 2. 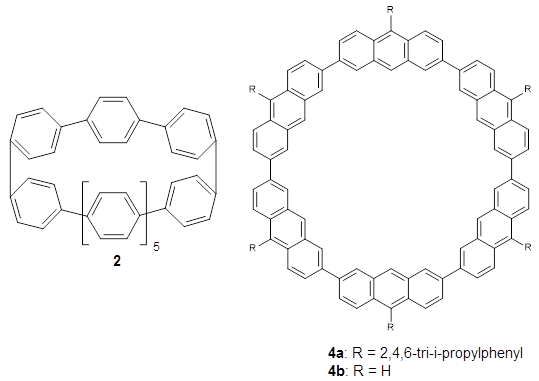 The structures of 3 and 5b (made with the parent macrocycle 4b) are shown in side view in Figure 1, and clearly seen is the achievement of the flatter ring. Figure 1. Computed structures of 3, 5, and 7. Following this idea leads to four symmetrical nitrogen-substituted analogues of 4b; and I’ll mention just one of them here, 6. As expected, 6 is perfectly flat. 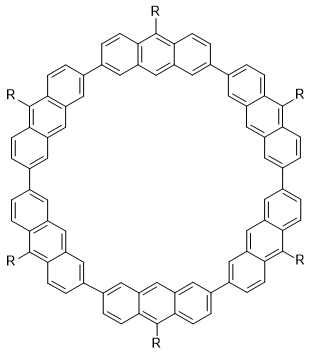 The ring remains flat even when complexed with 1 (as per B3LYP-D3(BJ)/6-31G(d) computations), see the structure of 7 in Figure 1. 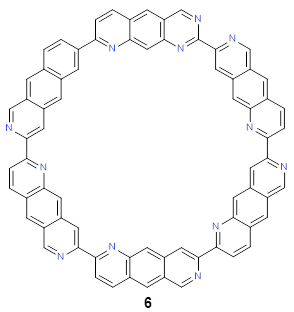 I also examined the complex of the flat macrocycle 6 (and its isomers) with a [5,5]-nanotube, 7. The tube bends over to create better dispersion interaction with the ring, which also become somewhat non-planar to accommodate the tube. Though not mentioned in the paper, I like to refer to 7 as Beyoncene, in tribute to All the Single Ladies. Figure 2. Computed structure of 7. 1. Bachrach, S. M., “Planar rings in nano-Saturns and related complexes.” Chem. Commun. 2019, 55, 3650-3653, DOI: 10.1039/C9CC01234F. 3. 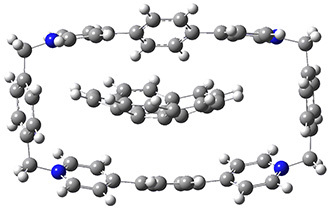 Yamamoto, Y.; Tsurumaki, E.; Wakamatsu, K.; Toyota, S., “Nano-Saturn: Experimental Evidence of Complex Formation of an Anthracene Cyclic Ring with C60.” Angew. Chem. Int. Ed. 2018 , 57, 8199-8202, DOI: 10.1002/anie.201804430. It never hurts to promote one’s science through clever names – think cubane, buckminsterfullerene, bullvalene, etc. Host-guest chemistry is not immune to this cliché too, and this post discusses the latest synthesis and computations of a nano-Saturn; nano-Saturns are a spherical guest molecule captured inside a ring host molecule. I discussed an example of this a number of years ago – the nano-Saturn comprised of C60 fullerene surrounded by cycloparaphenylene. Yamamoto, Tsurumaki, Wakamatsu, and Toyota have prepared a nano-Saturn complex with the goal of making a flatter ring component.1 The inner planet is modeled again by C60 and the ring is the circulene analogue 1. The x-ray crystal structure of this nano-Saturn complex is shown in Figure 1. Figure 1. 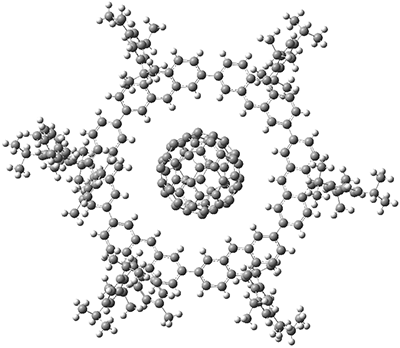 X-ray crystal structure of the nano-Saturn complex of 1 with C60. Variable temperature NMR experiments gave the binding values of ΔH = -18.1 ± 2.3 kJ mol-1 and TΔS = 0.8 ± 2.2 kJ mol-1 at 298 K. To gauge this binding energy, they computed the complex of C60 with the parent compound 2 at B3LYP/6-1G(d)//M05-2X/6-31G(d), unfortunately without publishing the coordinates in the supporting materials. The computed binding enthalpy is ΔH = -50.6 kJ mol-1, but this computation is for the gas phase. The computed structure shows close contacts of 0.29 nm between the fullerene and the C9-proton of the anthracenyl groups, in excellent agreement with the x-ray structure. These weak C-H…π interactions undoubtedly help stabilize the complex, especially given that the fullerene carries a very tiny Mulliken charge of +0.08 e.
1) Yuta, Y.; Eiji, T.; Kan, W.; Shinji, T., "Nano-Saturn: Experimental Evidence of Complex Formation of an Anthracene Cyclic Ring with C60." Angew. Chem. Int. Ed. 2018, 57, 8199-8202, DOI: 10.1002/anie.201804430. 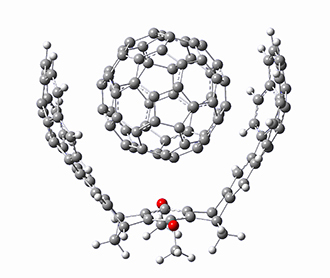 Capturing buckyballs involves molecular design based on non-covalent interactions. This poses interesting challenges for both the designer and the computational chemist. The curved surface of the buckyball demands a sequestering agent with a complementary curved surface, likely an aromatic curved surface to facilitate π-π stacking interactions. For the computational chemist, weak interactions, like dispersion and π-π stacking demand special attention, particularly density functionals designed to account for these interactions. Two very intriguing new buckycatchers were recently prepared in the Sygula lab, and also examined by DFT.1 Compounds 1 and 2 make use of the scaffold developed by Klärner.2 In these two buckycatchers, the tongs are corranulenes, providing a curved aromatic surface to match the C60 and C70 surface. They differ in the length of the connector unit. B97-D/TZVP computations of the complex of 1 and 2 with C60 were carried out. The optimized structures are shown in Figure 1. The binding energies (computed at B97-D/QZVP*//B97-D/TZVP) of these two complexes are really quite large. The binding energy for 1:C60 is 33.6 kcal mol-1, comparable to some previous Buckycatchers, but the binding energy of 2:C60 is 50.0 kcal mol-1, larger than any predicted before. Figure 1. B97-D/TZVP optimized geometries of 1:C60and 2:C60. 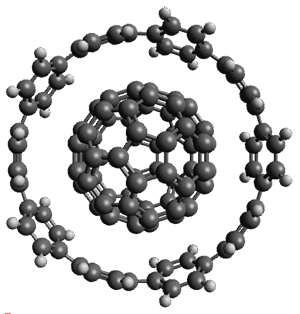 Measurement of the binding energy using NMR was complicated by a competition for one or two molecules of 2 binding to buckyballs. Nonetheless, the experimental data show 2 binds to C60 and C70 more effectively than any previous host. 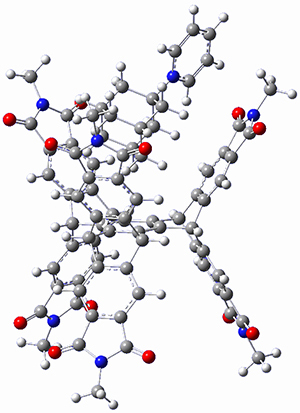 They were also able to obtain a crystal structure of 2:C60. (1) Abeyratne Kuragama, P. L.; Fronczek, F. R.; Sygula, A. "Bis-corannulene Receptors for Fullerenes Based on Klärner’s Tethers: Reaching the Affinity Limits," Org. Lett. 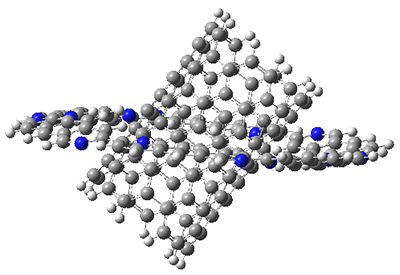 2015, ASAP, DOI: 10.1021/acs.orglett.5b02666. (2) Klärner, F.-G.; Schrader, T. "Aromatic Interactions by Molecular Tweezers and Clips in Chemical and Biological Systems," Acc. Chem. Res. 2013, 46, 967-978, DOI: 10.1021/ar300061c. Badjic, Hadad, and coworkers have prepared 1 an interesting host molecule that appears like two cups joined at the base, with one cup pointed up and the other pointed down. A slightly simplified analogue 1 of the synthesized host is shown in Figure 1. The actual host is found to bind one molecule of 2, but does not appear to bind a second molecule. Seemingly, only one of the cups can bind a guest, and that this somehow deters a second guest from being bound into the other cup. To address negative allosterism, the authors optimized the structure of 1 at B3LYP/6-31G* (shown in Figure 1). They then optimized the geometry with the constraint that the three arms in the top cup were ever more slightly moved inward. This had the consequential effect of moving the three arms of the bottom cup farther apart. 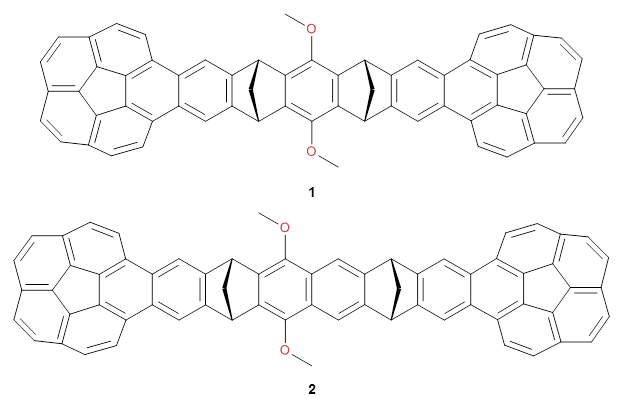 They next optimized (at M06-2x/6-31G(d)) the structures of 1 holding one molecule of guest 2 and with two molecules of guest 2. These structures are shown in Figure 2. In the structure with one guest, the arms are brought in towards the guest for the cup where the guest is bound, and this consequently draws the arms in the other cup to be farther apart, and thereby less capable of binding a second guest. The structure with two guest shows that the arms are not able to get sufficiently close to either guest to form strong non-covalent interactions. Figure 2. M06-2x/6-31G(d) optimized structures of 1 with one or two molecules of 2. Thus, the negative allosterism results from a geometric change created by the induced fit of the first guest that results in an unfavorable environment for a second guest. (1) Chen, S.; Yamasaki, M.; Polen, S.; Gallucci, J.; Hadad, C. M.; Badjić, J. D. "Dual-Cavity Basket Promotes Encapsulation in Water in an Allosteric Fashion," J. Am. Chem. Soc. 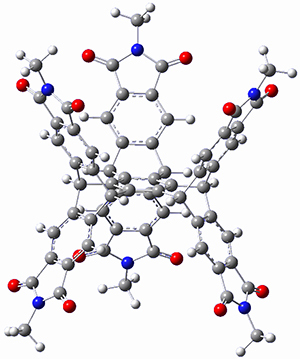 2015, 137, 12276-12281, DOI: 10.1021/jacs.5b06041. Grimme and coworkers have a featured article on computing host-guest complexes in a recent ChemComm.1 They review the techniques his group has pioneered, particularly dispersion corrections for DFT and ways to treat the thermodynamics in moving from electronic energy to free energy. they briefly review some studies done by other groups. They conclude with a new study of eight different host guest complexes, three of which are shown in Figure 1. Figure 1. TPSS-D3(BJ)/def2-TZVP optimized structures of 1-3. These eight host-guest complexes are fairly large systems, and the computational method employed means some fairly long computations. Geometries were optimized at TPSS-D3(BJ)/def2-TZVP, then single point energy determined at PW6B95-D3(BJ)/def2-QZVP. Solvent was included using COSMO-RS. The curcurbituril complex 2 includes a counterion (chloride) along with the guest adamantan-1-aminium. Overall agreement of the computed free energy of binding with the experimental values was very good, except for 3 and the related complex having a larger nanohoop around the fullerene. The error is due to problems in treating the solvent effect, which remains an area of real computational need. An interesting result uncovered is that the binding energy due to dispersion is greater than the non-dispersion energy for all of these complexes, including the examples that are charged or where hydrogen bonding may be playing a role in the bonding. This points to the absolute necessity of including a dispersion correction when treating a host-guest complex with DFT. As an aside, you’ll note one of the reasons I was interested in this paper: 3 is closely related to the structure that graces the cover of the second edition of my book. (1) Antony, J.; Sure, R.; Grimme, S. "Using dispersion-corrected density functional theory to understand supramolecular binding thermodynamics," Chem. Commun. 2015, 51, 1764-1774, DOI: 10.1039/C4CC06722C. 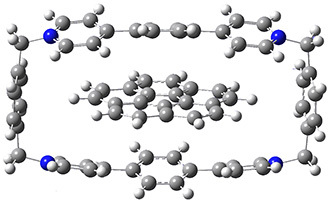 Stoddart recently reported the host compound ExBox4+ 1 and demonstrated that it binds planar polycyclic aromatic hydrocarbons.2 (I subsequently reported DFT computations on this binding.) 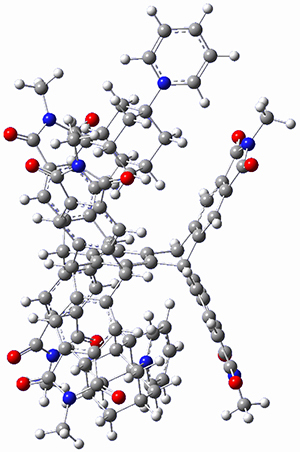 The twist in this new paper is the binding of corranulene 2 inside ExBox4+ 1. 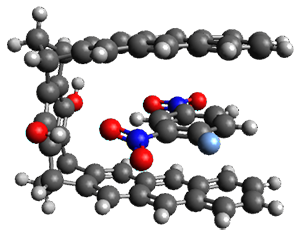 Corranulene is bowl-shaped, with a bowl inversion barrier of 11.5 kcal mol-1 (10.92 kcal mol-1 at B97D/Def2-TZVPP). The corranulene bowl is too big to fit directly into 1 without some distortions. The x-ray structure of the complex of 1 with 2 inside shows the width of 1 expanding by 0.87 Å and the bowl depth of 2 decreasing by 0.03 Å. The B97D/Def2-TZVPP optimized geometry of this complex (shown in Figure 1) shows similar distortions – the width of 1 increases by 0.37 Å (gas) or 0.29 Å (acetone solution), while the bowl depth of 2 decreases by 0.03 Å (gas) or 0.02 Å (solution). Figure 1. B97D/Def2-TZVPP optimized geometries of the complex of 2 inside 1 (a) ground state and (b) transition state. The calculated structure of the bowl inversion transition state of 2 inside of 1 is shown in Figure 1. 2 is planar at the TS. The experimental inversion barrier (determined by variable temperature NMR line shift analysis) is 7.88 kcal mol-1, while the calculated barrier is 8.77 kcal mol-1. The reduction in the bowl inversion barrier of 2 inside of 1 is therefore about 2.5 kcal mol-1. The authors argue that this barrier reduction can be attributed to about 0.5 kcal mol-1 of destabilization of the ground state of 2 along with 2 kcal mol-1 of stabilization of the transition state afforded by the host. This study thus confirms the notions of a host reducing a barrier (through both transition state stabilization and ground state destabilization) and induced fit. (1) Juríček, M.; Strutt, N. L.; Barnes, J. C.; Butterfield, A. M.; Dale, E. J.; Baldridge, K. K.; Stoddart, J. F.; Siegel, J. S. "Induced-fit catalysis of corannulene bowl-to-bowl inversion," Nat. Chem. 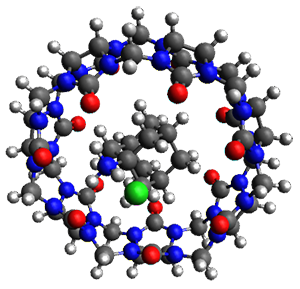 2014, 6, 222-228, DOI: 10.1038/nchem.1842. (2) Barnes, J. C.; Juríček, M.; Strutt, N. L.; Frasconi, M.; Sampath, S.; Giesener, M. A.; McGrier, P. L.; Bruns, C. J.; Stern, C. L.; Sarjeant, A. A.; Stoddart, J. F. "ExBox: A Polycyclic Aromatic Hydrocarbon Scavenger," J. Am. Chem. Soc. 2012, 135, 183-192, DOI: 10.1021/ja307360n. 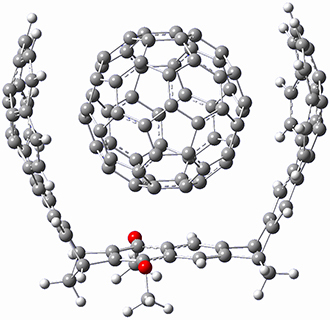 (3) Bachrach, S. M. "DFT Study of the ExBox·Aromatic Hydrocarbon Host–Guest Complex," J. Phys. Chem. A 2013, 117, 8484-8491, DOI: 10.1021/jp406823t.